Founded in 1996, Cryptologic has a strong focus on providing quality software. This provider is well known for it's user friendly design and attractive graphics. Often referred to as the grandfathers of online gambling, Cryptologic offers plenty of great games in a number of top online slot casinos. Cryptologic is a long standing software provider that has been in the business since 1996. It was originally a software development company that specialized in encryption technologies. Though, they quickly added online casino software to their repertoire as they discovered the growing popularity of online gambling. 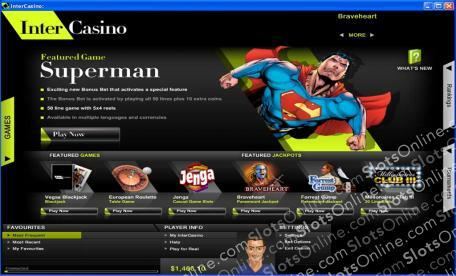 Since, they have developed the software for several of the most popular online casinos out there. They have become known for their exceptional online slots selection. All of their games feature the best in graphics and themes, making them extremely popular among online slots fans. Some of their well-known titles include Wonder Woman, Forrest Gump, Cubis, and Sudoku. Casinos such as InterCasino and VIP Casino feature the fantastic Cryptologic software. Check it out by downloading either of these excellent online slots casinos, or by trying out their instant play Flash version. With a huge selection of slots and slot tournaments, there is something to keep you busy at all Cryptologic casinos. Intercasino offers possibly the most unique slots experience online. While its bonuses are not the highest, the experience it provides should appeal to even the most jaded slots player. Become a VIP at VIP Casino to earn monthly cash back rewards while playing through their 75+ online slot games.